How does an airport get started? In the case of Lancaster Airport (KLNC - Lancaster, Texas), it started as the dream of a local resident, Guy Joe Smith. Guy-Joe was a Navy Pilot in WW2 and retired as a Senior Captain with Braniff Airways in the late 60's. Carving out a dirt strip on his family farm in 1964, Guy-Joe kept his Piper Cub in a converted implement shed. For many years, Guy-Joe could always be found at the airport and he was well loved and is remembered by our airport community. As the strip caught the attention of other local flying enthusiasts, 6-8 other aircraft were soon based there and a bigger runway was cut out of the surrounding corn and cotton fields. The Green brothers also loved flying. Investing in the airport, they eventually donated their development to the City. The City has maintained and expanded the Airport, attracting private investment to the area. The current proposed expansion will lengthen the runway to attract more corporate business and realign some adjacent roads to accommodate runway, ramp and hangar expansion. 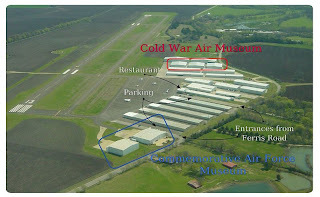 The airport is home to the Cold War Air Museum as well as the Commemorative Air Force Museum and a number of local businesses, planes and pilots. The City, Airport and Museums host a number of events at the airport every year. On event days a shuttle tram operates between the two museums, the restaurant and the parking areas. Check our links for current events and an area map.